The Department of General Medicine focuses on advances on the health of the people of Punjab and beyond through high quality, patient-centered care and education of the next generation of physicians. It is one of the core department’s of Capitol which performs the pivotal role of providing various outpatient specialties in terms of therapeutic and preventive care and lifestyle modification counseling. 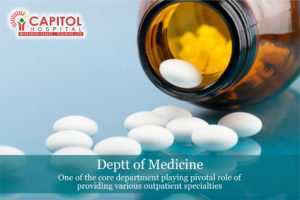 Department of General Medicine at Capitol includes a team of highly qualified and experienced physicians whose primary role is to deal with the prevention, diagnosis, treatment and provide immediate basic requirements of a multitude of patients in the hospital seeking relief. This makes it not only the best department in the region committed to patient care wherein the prime goal of the department is to combine the latest evidence-based medicine with experience and thoughtful decisions about the patients to foster wholesome wellness and healing. General Medicine is one of the departments considered to be the base specialty and its assistance is sought by all super specialties. The Department of Medicine & Allied Services forms the backbone of the hospital and through varied outpatient clinics, it provides not only therapeutic but also preventive care and lifestyle modification counseling. A dedicated team of experts provides preventive measures, early diagnosis and treatment of common disorders like diabetes, hypertension, bronchial asthma, hepatitis, allergy, infections and communicable diseases like malaria, typhoid, influenza to name a few. General endocrine clinics like for conditions relating to adrenal, parathyroid and pituitary glands. Thyroid clinics for conditions including overactive thyroid, enlarged thyroid (goiter) and thyroid lumps.